On May 23, 1934, Cardinal Dougherty called on all Catholics living in the Archdiocese of Philadelphia to boycott motion picture theaters. By doing so, Dougherty declared it sinful for any of the area’s 800,000 Catholics to enter a movie theater. 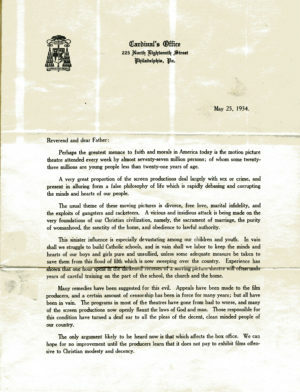 In his letter to the priests of the Archdiocese, Dougherty called the motion picture theater “perhaps the greatest menace to faith and morals in America today.” Dougherty and many others felt that most of the movies being shown were indecent and that drastic action was need to send a message to Hollywood. The effect of the boycott was immediate, over 300,000 Catholics signing pledges to avoid the movies and ticket sales dropped around 20 percent. The decrease in revenue led to numerous theater owners and movie studios writing to Dougherty asking to end the boycott; however, he replied that he had “no intention to recede” from his stance. Dougherty also received a wide range of letters from regular people from around the country. The response was largely supportive, with both Catholics and Protestants praising him for standing up to the immorality of Hollywood. However, some believed that a full boycott went too far, with petitions questioning the move from State Senator McCreesh and Democratic Committee Chairman John Kelly (Princess Grace Kelly’s father). One major concern of Dougherty’s was that other bishops were not joining him in the total ban. Rather places like the Archdiocese of St. Paul were publishing white lists, movies that they deemed Catholics could watch. Dougherty saw this as creating division which would result in only a “milk-and-water” resolution on movies. While Cardinal Dougherty was strong in his support for the general boycott, everyday Catholics began to start wavering by the winter of 1934. Indeed, many wrote letters to Dougherty asking him to release them from their pledge and stating that many of their friends had already abandoned it. Many complained that the movies were their only form of entertainment and that seeing an approved movie at a theater was better than going to a beer hall or other like establishment. However, Dougherty never did release anyone from their pledge instead reminding them that they had a religious duty to follow his orders in matters of morality and that disobeying the boycott was a serious sin. Dougherty would often clarify that the boycott was not against movies per se just the theaters so if a parish hall had a film screening of an acceptable movie then Catholics would be permitted to go to that. The difference being that the theaters were “occasions of sin” and therefore it was immoral to visit such places. Nevertheless, support continued to wane so much so that by 1938 people would write to Dougherty asking if the boycott was still in effect since they heard so little about it and local priests were giving conflicting instructions. 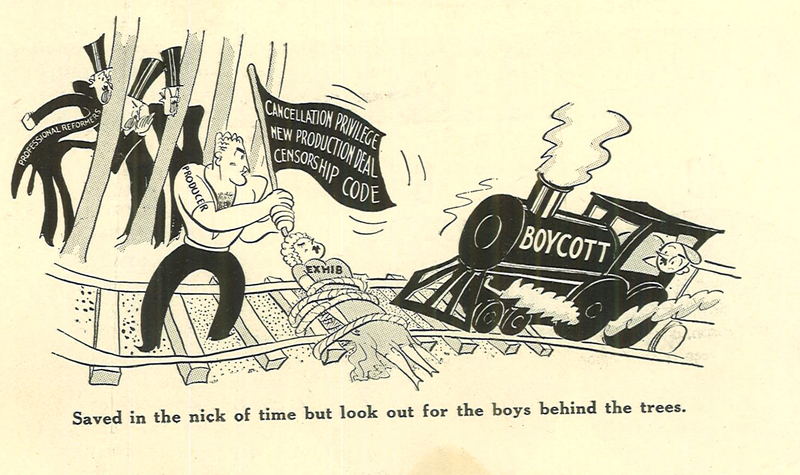 In fact, Dougherty never officially ended the boycott, so it technically continued up until his death. While the boycott failed to have the staying power that Dougherty hoped for, it did have a large impact on the movie industry. In June of 1934, the Motion Picture Association of American agreed to stronger self-censorship and created the Production Code Administration, headed by Catholic layman, Joseph Breen. Another effect of the boycott was the growth in power of the Legion of Decency, a Catholic organization which reviewed and rated movies (the history of the Legion will be explored more in a future post). 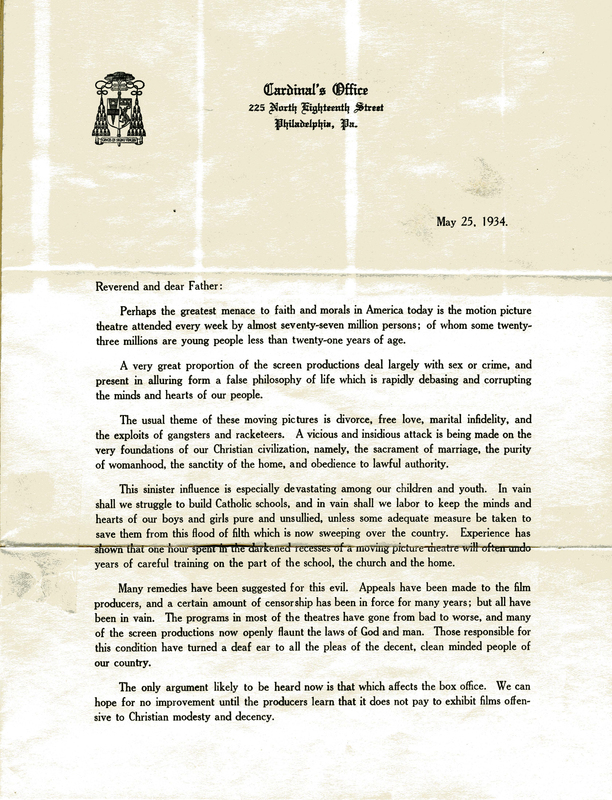 Cardinal Dougherty, “Letter to Priests of the Archdiocese,” 05/25/1934, MC78-.1934.05.25, https://omeka.chrc-phila.org/items/show/7868#?c=0&m=0&s=0&cv=0. Frederick Lane, The Decency Wars: The Campaign to Cleanse American Culture, (Amherst: Prometheus Books, 2006), 90. Cardinal Dougherty, “Letter to Harry Warner,” 10/03/1934, MC 78- 81.184, https://omeka.chrc-phila.org/items/show/8106. John McCreesh, “Letter to Cardinal Dougherty,” 01/9/1935, MC 78- 81.184; John Kelly, “Letter to Cardinal Dougherty,” 08/23/1934, MC 78- 81.184, https://omeka.chrc-phila.org/items/show/7869. James Foley, “Letter to Cardinal Dougherty,” 03/30/1936, MC 78-81.183; https://omeka.chrc-phila.org/items/show/7894. Cardinal Dougherty, “Letter to Margaret Grudy,” 01.04/1935, MC 78- 81.184; https://omeka.chrc-phila.org/items/show/7896. Christina Casey, “Letter to Cardinal Dougherty,” 04/04/1938, MC 78-81.183; https://omeka.chrc-phila.org/items/show/8103. Thomas Doherty, Hollywood's Censor: Joseph I. Breen and the Production Code Administration, (New York: Columbia Press, 2007), 67.